The Free Job Application Form is a simple two page document. 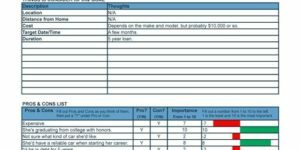 It’s a fill-in-the-blank form for collecting information about job applicants. 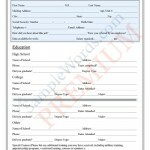 The job application form is intended to be printed and filled out by potential employees. The pdf document below allows you to collect basic information about a potential employee. Employers can collect job applicant personal data, address and contact information. There are also fields for application date, start dates, employment status, education and employment history. 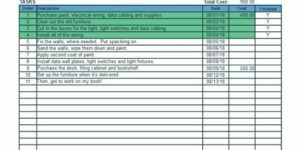 The bottom of the first page provides an area for listing skills related to the position. 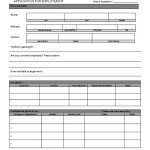 The second page of the form includes 4 sections for previous work history. This allows allows the candidate to provide details about their past jobs. 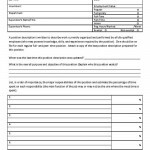 The second page of the free employment form can be printed multiple times if the applicant has more than 4 previous positions. If you are looking for more employment forms for small business and hiring managers, then preview our list of Personnel and HR documents. This page includes docs for payroll, evaluations, information sheets, time sheets, verification, grievances and several other human resources and employment related forms. Hii,…thanks for the Application form sample, bye the way there is no space where i can put my photo..
Social security numbers are unnecessary for a job application. It’s more appropriate to get this information after you hire an individual, often through the IRS Form W-9. If you need it for a background check or drug check prior to hiring, then it is a better idea to use a separate form that includes the appropriate legal language. You forgot to put social security number on there. We need enough people interested in an electronic form at a slightly higher price to justify the cost to make the form version. At this point, you are the 2nd request in 6 months, so I’m not sure its feasible, but it is something we have in mind and will likely do as the site grows. We appreciate the comment because if more people comment that they want the electronic form, the faster we will implement. 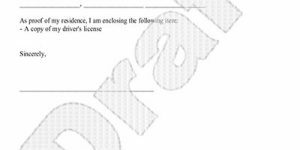 Needs a signature line where applicant attests that the application is true and correct and gives the potential employer permission to do a background check. We’ll look at adding a signature line when we redo the form. We probably won’t add a background check, but rather make a separate background authorization form. We’ll put that on our list. Agree about the electronic form. That would be a MUCH nicer feature… people might not give you feedback if they want it… they just won’t buy it. The fact that you got 2 people asking for it means 2 people took time from their day to help you improve… I’d say to every 1 person asking for it… at least 10 didn’t bother to ask or just hoped on the next site. I’ll be the third person for you. I am not buying a pdf that your applicants aren’t able to type into it will take me 1 hour to type out my own with more customized fields. I would pay for the form capabilities though! You are correct and I think we are getting enough requests to justify the time to make an electronic pdf form. Electronic form fields have been added to the premium version of the job application. How do I address that a car is mandatory for this position. Not sure of how to write it on the application.